Published on August 25, 2011 in Fun Stuff and General. 1 Comment Tags: American Debt, US Debt, USA Debt. 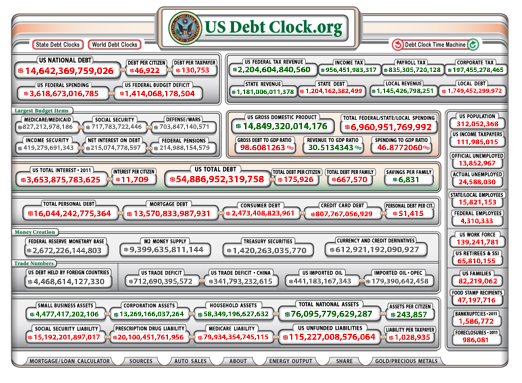 Just in case you think your personal finances are in bad shape, have a look at the US DEBT CLOCK. This is why the global markets are in turmoil and governments struggling under the debt load. CLICK ON THE IMAGE TO SEE THE DEBT CLOCK TICK OVER LIVE! Published on August 12, 2011 in Fun Stuff. 1 Comment Tags: $20 Bill, Conspiracy, Conspiracy Theory, US Bill. I previously blogged about a conspiracy theory about Lincoln and Kennedy – here’s another one that’s equally creative. Enjoy!